When it comes to the Fourth of July, warmin’ up the grill is the first thing that comes to my mind! It doesn’t matter if it’s beef, chicken, pork, or hot dogs (whatever they are). Shoot, throw some veggies and/or fruit on for a complete outdoor meal. Dad has even perfected tator tots and french fries on the gas grill. Why use the oven if you don’t have to? Because the St. Louis metro area had temps over 100° for several days in a row! Now, my hubby, Steven, will fire up the grill in practically any weather, hot or cold…but this heat has taken its toll, and our regularly scheduled grilling activities paid the price. Oh, well, that’s why you always have a backup plan, right? Our backup plan for the chicken chillin’ in the fridge was to bake it in the oven. 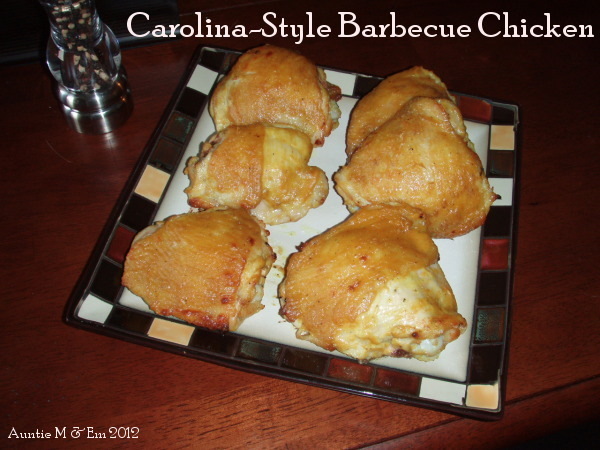 I receive the Recipe a Day emails from Food Network (which I love), and one of the recipes earlier this week was for Carolina-Style Barbecue Chicken. Amazingly, I had most of the ingredients in my pantry and chicken defrosting in the fridge…it was meant to be! This is a mustard-based sauce that has plenty of zing, and just the right amount of sweetness to balance the sharpness of vinegar. Left: Sauce, mixed and ready to go. Middle: Marinating chicken. Right: It’s in the oven! Since I wasn’t sure what the “heat grill to medium” equivalent for the oven was, I referred to another recipe for chicken thighs to figure out what temperature I should use to bake the chicken. A recipe that reminded me how much I love baked chicken thighs… Anyhoo, once I figured that out, I got started on the sauce. It was really interesting to taste how the flavors changed just by adding some brown sugar or hot sauce. Ten years ago, I would have shied away from this, merely because of the hot sauce. I’m so glad my tastes have changed! The hot sauce adds a really pleasant zing that would be missed if left out. While my chicken was marinating, I prepped my baking sheet with foil and a cooling rack sprayed with non-stick spray. In the past, I’ve baked thighs directly on a sprayed pan, but have been disappointed with the way the thighs sit in the cooking juices…not real crispy, and nearly defeats the purpose of baking one’s chicken. By getting the thighs up on the rack, the finished result was quite good! Now, I’m going to pull a “Man Behind the Curtain” on you…pay no attention to my not-so-clean oven (Wizard of Oz film fans should get the reference)…though, I guess it could be worse! Baking time should have been 10-12 minutes per side…if I had gotten the temp on the oven correct! I accidentally preheated my oven 25 degrees lower than my reference recipe, and it took me nearly twice as long to get the thighs done all the way through. Once I figured out and corrected my error, it didn’t take long for them to get done! The chicken thighs turned out really well! Steven said they were fantastic, and that I should definitely make them again. We both agreed that the sauce was really flavorful, and the chicken was nice and tender. In the future, I will probably use boneless, skinless chicken breasts, and marinate them longer. I think the good flavor of the sauce would permeate the meat more, and keep it really juicy and flavorful. Baked was good…and I can’t wait to try it on the grill! Preheat oven to 450 degrees. Whisk the yellow mustard, vinegar, brown sugar, mustard powder, hot sauce, Worcestershire sauce, 1/2 teaspoon salt, and pepper to taste in a bowl. Whisk in the butter. Season the chicken with salt and pepper, then toss with about one-third of the mustard sauce in a large bowl until coated. Let sit at room temperature for 10 minutes. Line rimmed baking sheet with foil. Spray a cooling rack with non-stick cooking spray and set on baking sheet. Put about 1/4 cup of the remaining mustard sauce in a small bowl for basting and reserve the rest for topping. Bake the chicken, basting occasionally with the sauce, until a thermometer inserted into the thickest part registers 170 degrees F, 10 to 12 minutes per side. I basted the chicken every time I tested it for doneness, but I would probably do it every 5 minutes or so next time. Serve the chicken with the reserved mustard sauce, sliced tomato and macaroni salad, if desired. Categories: Chicken, Food | Permalink.